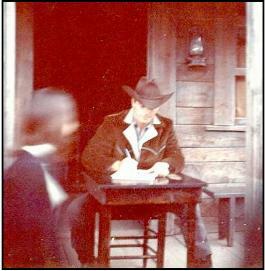 A VISIT TO GHOST TOWN IN THE SKY, August 1967 - "Jaxie took the photo on the right with her Brownie Starmite. Now there's a blast from the past. The other two were taken by her father with his trusty Polaroid. Maybe someday we'll find out why August in Maggie Valley, North Carolina called for Peter to wear a jacket more suitable for fall in Wyoming." The Laredo gang came to promote their new show by appearing in the parade that publicized our local Auburn District Fair (now the Gold Country Fair). Peter was announced as the grand marshal of the parade (making the others his minions or "court" or something). Looking back it seemed odd to think of Peter, the youngster of the group, being the grand marshal riding in the stage coach while the others rode on horseback, particularly in light of the relationship between Peter's character and the Captain played by Phil Carey. 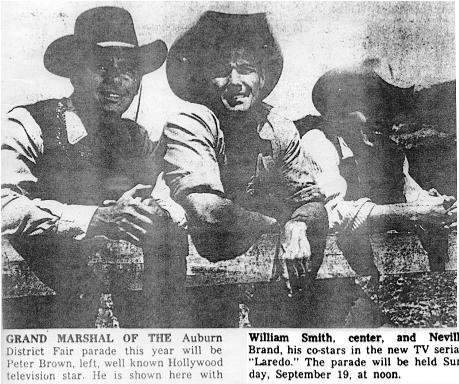 The parade took place on September 19, 1965, only three days after the first episode of Laredo aired. 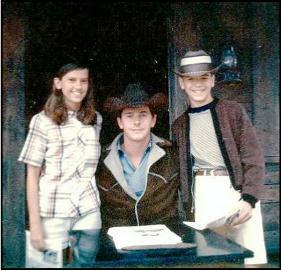 Peter was really the only well known actor of the group, having had lots of fans from Lawman. The pictures below come from the Auburn Journal, a little local paper that came out twice a week and didn't save picture files. These came off microfiche from the library. There were no pictures published that came from the parade itself. We didn't claim this was a good paper. Our friends who were there can't find the Brownie snaps they took at the time. Our friend Debbie was a child at the time and coming from a family with six kids and only one television, she didn't remember Lawman. Her big parade thrill was seeing "Granny Goose." 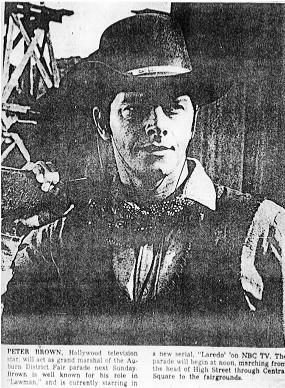 Prior to Laredo, Phil Carey was the star of a very successful series of potato chip commercials in which the punchline was his proclaimation that he was Granny Goose. Carey, an imposing man, about 6'6" would come into the commercial wearing a cowboy hat and a western jacket and looking not too much like someone to be made fun of for being called Granny Goose. 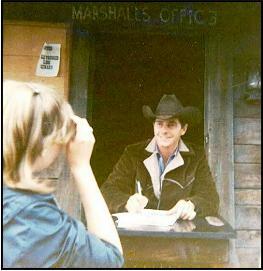 Debbie did remember William Smith coming to her side of the road on his horse to sign some autographs. When she looked up into his face, she thought he was the biggest man she'd ever seen. Her teen-age sister however, was very aware of Peter and still remembers getting him to sign the front of her shirt as he walked his way thru the fair crowd later. (Of course, these days girls just take off their shirt and have a good-looking guy like Peter sign their bare breasts.) No one remembers if Neville Brand was there, but Peter has talked about how he, Bill and Neville had a whole act they would take to various rodeos and fairs in which they sang and joked around. "On Tuesday, May 21, 2002, I arrived at my local car wash and had to go to the bathroom. I tried the women's restroom but the door was locked so I tried the men's and as I touched the knob out walks Peter Brown. I have been in love with Peter Brown since the 1960s and always thought I should know him. My maiden name was Dianne White. Anyway I introduced myself and we had a nice chat and I only wish I had been wearing anything but the sweaty gym clothes and no makeup. He was darling and has moved into my area. I certainly hope our paths cross again. Just thought you might enjoy this." Dianne added subsequently: "I will be having the cleanest car in town from now on. I had to call my room mates from college as we use to talk about him all the time. He looks great and it convinced me that I am never leaving my house again without makeup." "I met Peter (Pierre Delapp) in 1954 in Spokane, Washington, shortly before he joined the army with his best friend Don Blair. He and Don went to North Central High School in Spokane. They graduated in 1954 and joined the Army together; Don went to Germany, Peter to Alaska. Peter and I dated during our teen years, in 1954 and 1955. Peter's mother Mina, had a tv show in Spokane. Don came home from boot camp two weeks before Peter did; Don and I fell in love and married 3 years later. Sometime in the early 1960s Peter was in San Jose with a group of friends for an All-Star baseball game and he invited me and Don to dinner with the group. As I recall there were about 20 or so. Among them was Joe Dimagio and Doug McClure. It was an unforgettable time. We asked Ginger if Peter had gone by the name Pierre back then. 'No. He was going by Peter then, but wanted to make it very clear that his former name was really Pierre Delapp. He was quite proud of his heritage....and I think to him the French pronunciation sounded rather suave. He was quite the actor, even then.'" NOTE - Peter didn't change is last name for show biz reasons. He legally changed his name to Brown (his stepfather's surname) long before becoming an actor. As for the "Pierre" part...Peter's birth certificate states he was born with the name Peter Lynn Delapp. 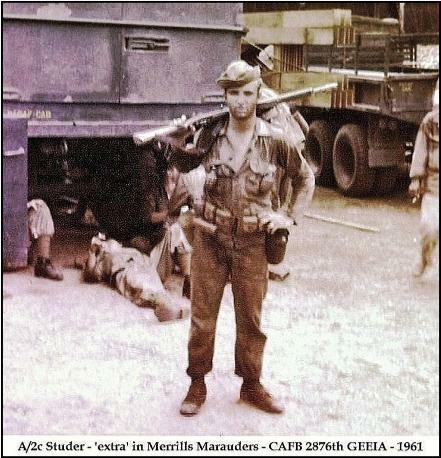 He probably wanted to impress Ginger (among others), so he "adopted" the cool sounding French derivation of his first name. "A few years ago, I was in a rather sad state of mind. I had been without a job for about 4 months and I was growing more and more depressed. One day, I found a book of celebrity addresses. So, I figured, why not try it. The first letter I wrote was to Mr. Brown. Not once did I think he would actually respond to my letter. But, exactly 2 weeks after the letter was mailed, I got a response. It completely surprised me. His response made me feel good about myself. So, I wrote a thank you letter to Mr. Brown. And again, he surprised me... He sent me a small picture with a note. (Two weeks after receiving Mr. Brown's first response, a computer company hired me.) Most people would say that I'm being silly, but Mr. Brown saved my life. His response to my letters, helped snap me out of my depression. Now here I am, 26, and working for the local school district. My job may have changed, but that feeling I had when I got Mr. Brown's response is still with me. And if, by chance, I were to meet Mr. Brown someday...I wouldn't know what to say besides, thanks." 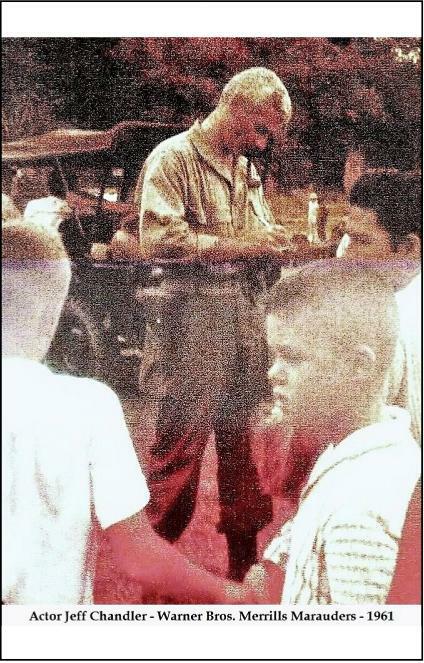 "I found the attached photo, which I think may be of Mr. Brown. 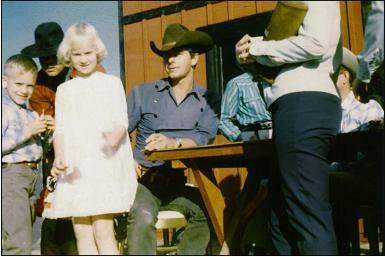 It was probably taken in the mid 60's, somewhere in the Phoenix area. My older sister (not the one in the photo) was a huge fan and made my folks take us all to the appearance. If this is Mr. Brown, hope you enjoy; just thought I'd pass it along." 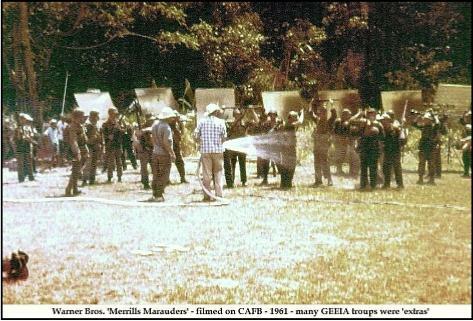 "In 1961, a few of us stationed on Clark Air Force Base in the Philippines were asked to be extras in the filming of 'Merrill's Marauders.' Of course, how could anyone turn that down? Who would not want to be in a Warner Brothers film? 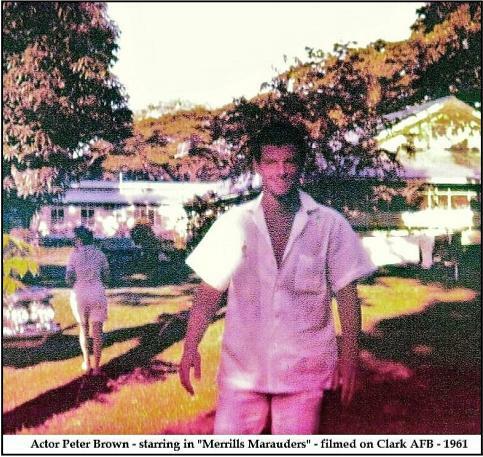 One morning, Peter asked me and three other extras to join him for breakfast at the Base Officers' Club...how I remember that well. I recall that Warner Bros gave us 'box lunches' during the shooting everyday. It was quite a lot of fun for sure. 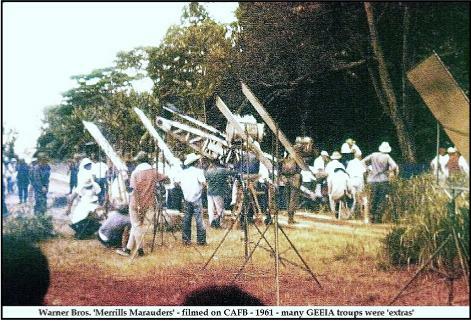 Photos from the set in the jungle of the Philippines." "I would like Peter to know his kind words made a profound impact on an inexperienced massage therapist 30 years ago. After 32 years in bodywork our encounter remains one of the highlights of my career. In 19884-86 I was asked to do on-site work for a celebrity event at a resort in central Oregon. Newly licensed and never having worked on celebrities I was very nervous to say the least. Peter was my first assignment and to make matters worse I'd had a crush on him since the Lawman TV show! The positive feedback and respect from Peter gave me a huge boost in confidence. 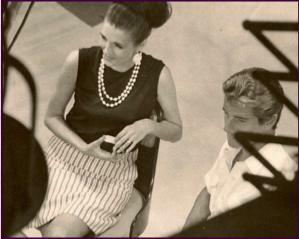 For the past 32 years my clinic for massage therapy has been highly successful and fullfilling, thanks in part to wonderful clients and thoughtfull people such as Peter...Thanks Peter"
FROM ALISON - "This is a picture of my mother (Millie Boring, Chattanooga) as she interviewed an actor in the 60's on her local TV show, Focus. My mother passed in October, 2013. Before she passed we looked through old pics and we asked Mom who this was and she thought that it was Peter Brown. He was a really handsome man and Mom's recollection was that he was very gracious and easy to talk to...When I started researching I was sad to see that he has also passed now. I wish the best for his family and hope you enjoy yet another picture of this handsome, gracious man...Weren't they so young and so beautiful?" 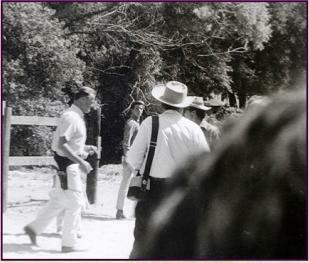 "Met Mr Peter Brown at a Lone Pine Film Festival one year and mentioned this photo... Taken at Corriganville in 50's or 60's"